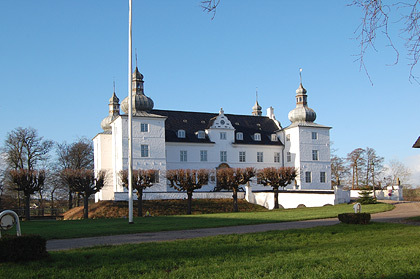 In December I delivered a printer to Engelsholm Folk High School and work with ceramics teacher Claus Domine so he can offer 3D printing as an option at the school. We did some 3D scanning with the with 123D catch IPhone app to find they have recently upgraded it and was amazed with the result. With good lighting and making use of the guide on the app we got some good results. We printed a version of crumpled paper in clay. Claus Domine using the 123D catch IPone app. 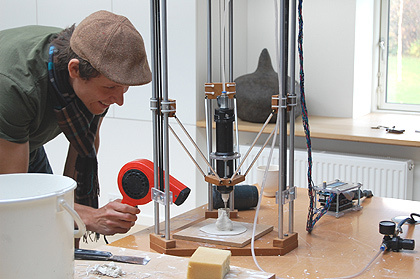 3D PRINT WORKSHOP INTERNATIONAL CERAMIC RESEARCH CENTER, DENMARK. 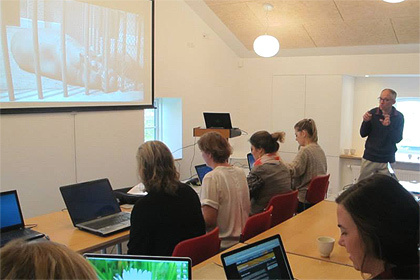 Over the weekend of 26/27th October I presented a workshop at ICRC, Guldagergaard, Denmark. The aim of the workshop was to look at ways of working with digital media and to offer participants the opportunity to model their own digital forms and to learn how to use the 3D printer. 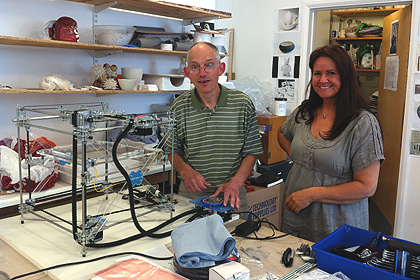 I supplied one of my delta ceramic 3D printers that will remain at the center for resident and visiting artists to use in the future. 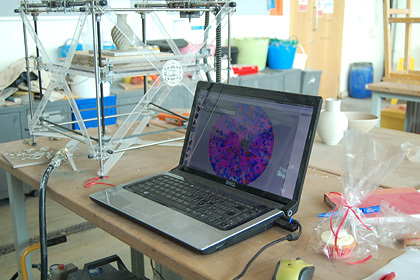 The workshop offered tuition in 3D computer modelling using the open source Blender software. Each session was based around the online tutorials that are here. 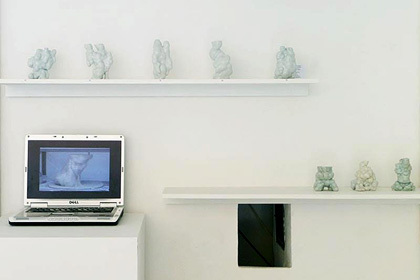 Once participants had their own .stl 3D files they were taken through the process of ‘slicing’ the file ready for the printer with the Repetier-Host software. This, preparing clay and using the printer has been documented in the video below. I would like to thank all who helped and took part in the event for their warm and very positive feedback. 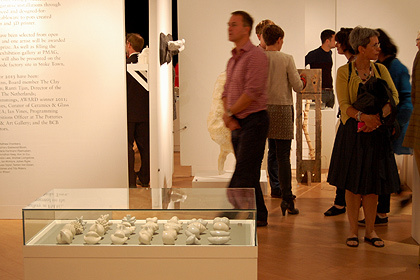 The 3rd British Ceramic Biennial opened in Stoke -on-Trent on Friday 27th September and runs until 10th November. The main festival is spread across two venues. The larges part comprising a number of different projects can be found at the original Spode factory site in Stoke town. 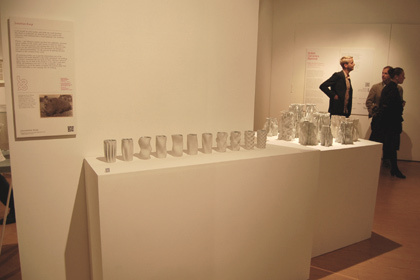 Then the AWARD 2013 exhibition in which I have been selected is at The Potteries Museum & Art Gallery in the city centre. Cosine Sine Morphology - This work represents a line of 11 elements capturing the progressive morphology of the wave pattern created by the mathematical sine and cosine function. One function is set in the horizontal plane and the other in the vertical plane and by altering the parameters a complex changing structure can be generated over time. A sort of animation that is frozen in time and captured in fired porcelain clay. Iceberg Field - Each structure is generated from the same computer code. 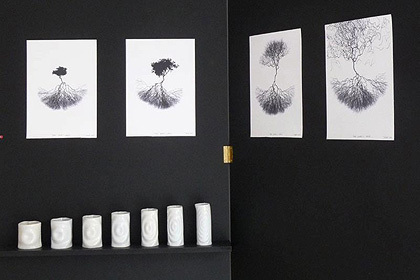 This work is about the beauty to be found in apparently random natural form. The algorithm used has an inbuilt randomness set within parameters, as with the formation of icebergs. 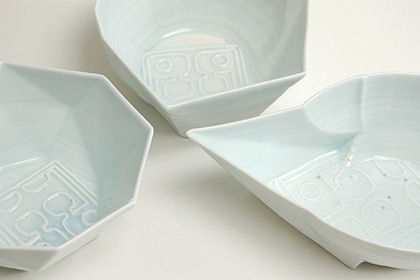 The 3D printing technique offers a timeless sense of layering while the porcelain echoes the translucency of ice. Seed Bed - This is more about the fundamental concept of evolutionary morphologies. My working method lends itself to altering the computer code to generate related and evolving shapes. 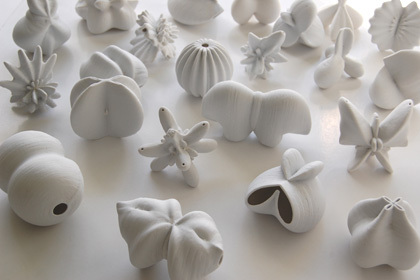 Being able to print these unique and individual forms directly from the computer represents the strength of this technology and fulfils my desire to explore the possibilities of form. My interest is in how at a basic evolutionary level we respond to natural forms. We have an inbuilt propensity towards natural forms and patterns, such as curvature, repetition, symmetry because we are part of that same natural world. The first three day get together of this project took place starting the week 16th September on the beautiful Netherlands Island of Vlieland. 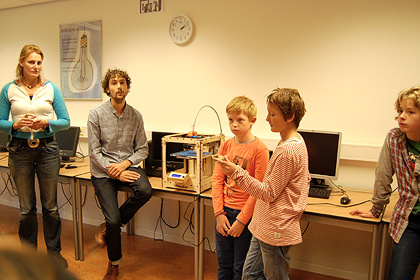 My involvement is to be 3D printing advisor to the technology department of Alde Valley High School. The Leiston school is to be linked with schools from the Netherlands, Germany, Sweden and we hope a Portuguese school. This EU funded Comenius project is primarily about cultural exchange between communities but based around a common subject that in this case will be 3D printing. Over the two years of the project each school will host a visit from the other partner school. The aim will be, through practical experience to see how best to integrated 3D printing into the school syllabus and general teaching activity. I have documented the build of my delta 3D printer here. The RapMan I converted and helped install to print with ceramic has became the latest addition to the digital making facilities in the 3D design department at Plymouth University. 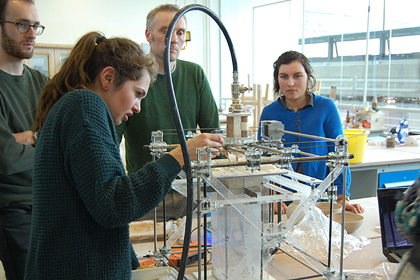 The Ceramics Printer will be a valuable addition to the two student-run plastic 3D Printers already in use in the students' studios. Earlier I gave a talk to Plymouth students on digital ceramics as part of the Crafts Council's Hothouse program for emerging makers. 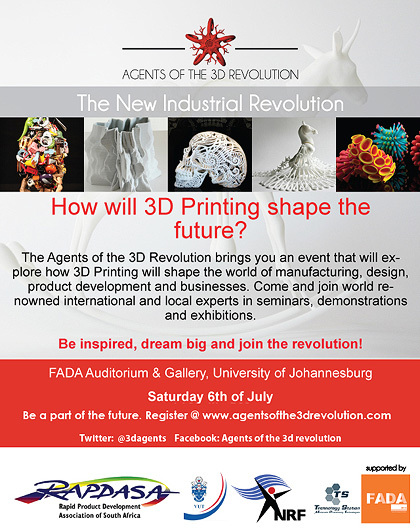 The Agents of the 3D Revolution aims to to bring about a change to the way in which the world sees and uses 3D printing. Through our events we will educate and inspire, showcasing and bringing the best of the best in the world! 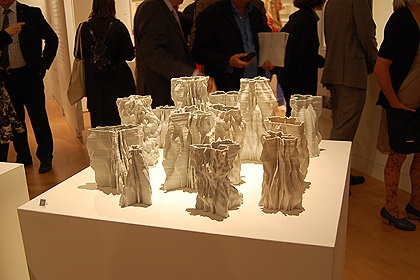 The Agents of the 3D Revolution brings together the best in 3D Print design and art, globally. Showcasing and developing the true revolution all from the southern tip of Africa. Agents are currently moving onto the next phase of the revolution and there will more info to be revealed shortly. 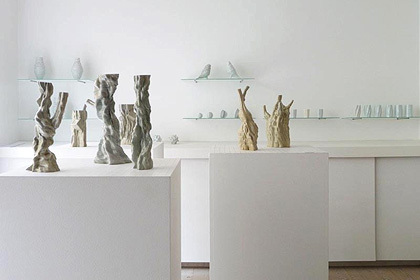 Leach Pottery Museum, St Ives. 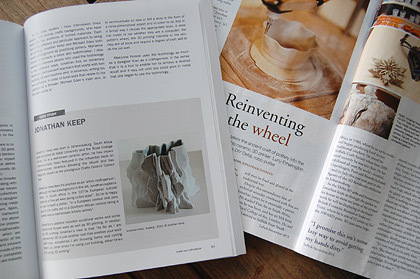 Echo of Leach presents a study of ways in which digital technologies can be used to design and make a new ‘21st Century Standard Ware’ whilst maintaining the integrity and tradition of handcrafted processes. 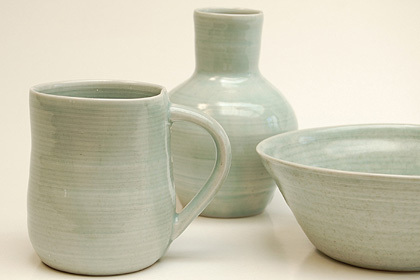 Emerging from the doctoral research of ceramicist Matthew Tyas, in conjunction with the Leach Pottery and Falmouth University’s Autonomatic Research Group, this new Echo of Leach collection is rooted in the design and principals of the original Leach Standard Ware, developed by Bernard Leach and produced at the Pottery until the late 1970s, and the current Leach Tableware. Invited to participate in this exhibition my starting point was to print the standard ware mug, bowl and vase from the CAD files provided by Matthew Tyas. The idea was to then take these three shapes and explore them further through digital manipulation. This resulted in a set of decimated bowls. The thought here being to show the process behind the technique of making. As in throwing the throwing rings are left leaving the finger print of the hand made. With my bowl set I have gradually increased the fingerprint of the digital mesh, or more technically decimated the high quality round bowl mesh by half each time. 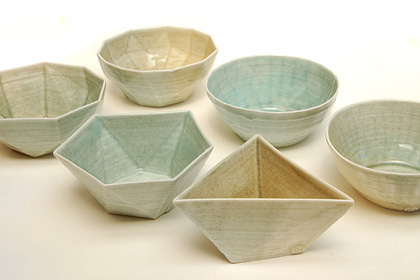 This set of bowls I then took a step further booleaning two bowls together to create a new form and very prominently printing the Echo of Leach stamp in the base. 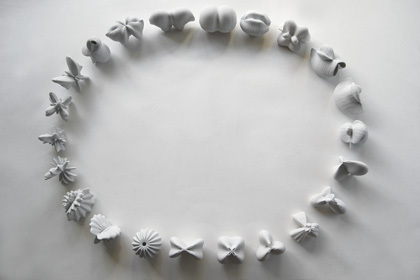 The bi-annual Nordes conference and summer school includes an exhibition where my proposal of 'Spherical Harmonics: Experiments in 3D printed ceramic form' was accepted. For further information have a look at the conference publication PDF pages. 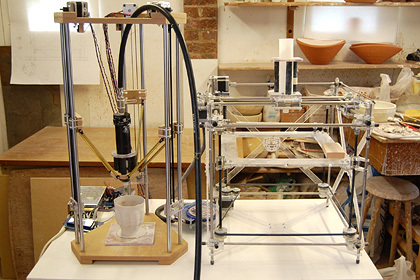 Since 3D Systems stopped the production of the Bits from Bytes RapMan (right printer) I have been looking for a replacement rig to adapt to print with clay. With no obvious replacement and liking the look of the delta style 3D printer I have experimented with building my own (left printer). Initial tests have proven more than satisfactory as can be seen in the vide above. 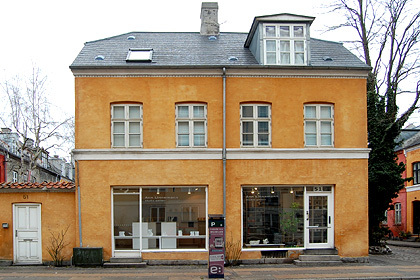 A spring exhibition at the Ann Linnemann Studio Gallery in Copenhagen. 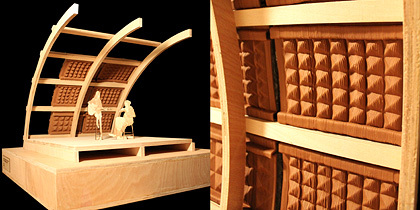 I have been helping Ben Pipkin a postgraduate student at the Birmingham School of Architecture with a project of his. With an interest in design through making and the potential of 3D printing as a construction process Ben proposed a building that is essentially a canopy that is populated and subsequently distorted by volumes of activity. 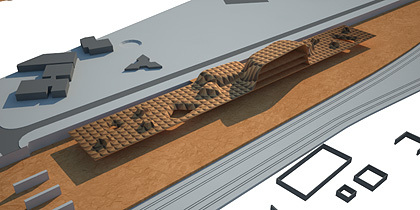 Clay is excavated from the shaded space below and sent via a pulley system up through the central production space, where it is refined/printed/glazed/fired to form the external cladding components. The building will ‘shed its skin’ on an annual basis, with the aim of developing a new ornamental style based around rapid production. 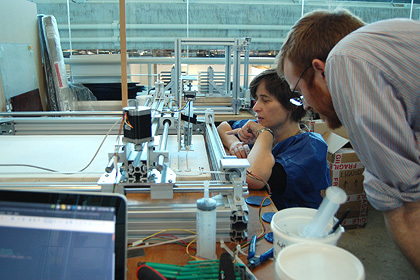 Autonomatic is a research group at the University of Falmouth whose focus is on the use of digital tools and making in the 21st century. I was invited as visiting artist to lecture and demonstrate the digital processes that I have developed. Of particular interest was the bespoke digital slip trailing machine that members of the group are developing lead by Dr Katie Bunnell. Very similar in construction to the 3D printer I use this equipment moves in a flat plane but could be easily adapted to add the z axis and work in 3D. Another research group member I was very pleased to catch up with was Tavs Jorgensen. It was good to see first hand his One Liner project and his research into digital Pinscreen tools. 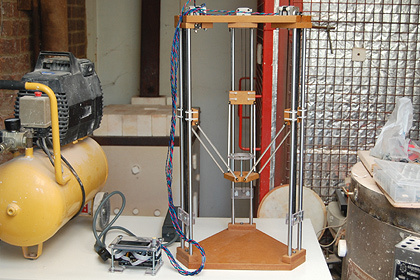 I do like the simplicity of the compressed air extrusion print head for printing in clay. The one draw back is that the soft clay needs support to build up the forms and does not work well on curved and more complex shapes. 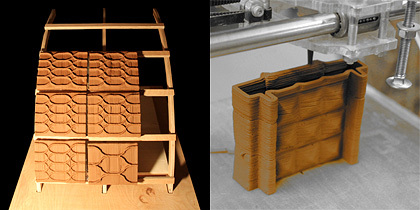 I have developed a further adaption to my Bit from Bytes RapMan printer to offer clay powder support during printing. 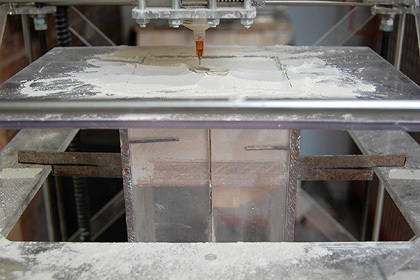 The powder is the same clay as used in the build and brushes of easily from the print. See video above.